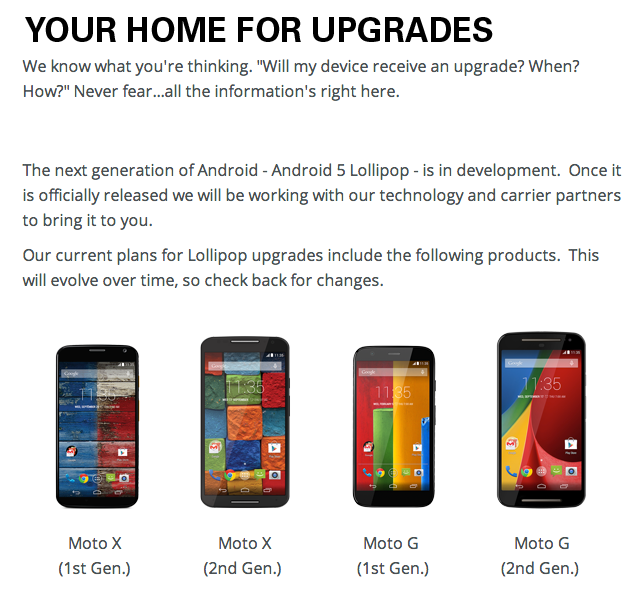 Following directly after the announcement of Lollipop by Google, Motorola was quick to announce upcoming updates for most of its devices. Included in the list of supported devices are of course the first and second gen. Moto X phones, as well as all of last year’s DROID units. For those among us who need a more visual representation of what is coming to Motorola device owners, Moto has set up a special tracking page for the Android 5.0 update. Not only are users able to see what version of Android their phones are currently running, but Motorola provides a dropdown menu to show information for carrier-specific units. In general, any Motorola device owner can use the page, not just those looking to keep an eye on Lollipop. You can check out your status by following the link below.